We well-known manufacturers of Deep Fat Fryers, Chicken Griller, Shawarma Maker & Sandwich Griller which are massive demand in food industry. These are manufactured using high grade stainless steel and are highly demanded in food & catering industry. Offered at competitive prices. These are known for features such as easy to move and clean, robust finish standards and corrosion resistant finish. Moreover, our range of Kitchen Equipment Accessories can also be availed in customized forms. We are looking for queries for Steel Kitchen Equipment And Accessories from Tamil Nadu, Kerala, Karnataka & Andhra Pradesh. We hold expertise in offering Portable Double Portion Deep Fat Fryer that are highly durable and robust in design. These are fabricated using quality-tested material and available in both standardized & customized forms. Backed by our customer friendly approach, we also provide our range at competitive prices. 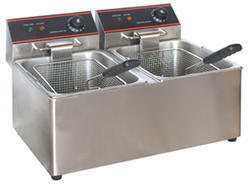 We hold expertise in offering Double Portion Deep Fat Fryer that are highly durable and robust in design. These are fabricated using quality-tested material and available in both standardized & customized forms. Backed by our customer friendly approach, we also provide our range at competitive prices. Our clients can avail from us an array of Chicken Griller, which is used to prepare chicken in a more convenient and easy manner. It is manufactured using quality material like stainless steel and is available in varied specifications. Offered at competitive prices, our range of Chicken Griller finds application in hotels and restaurants. 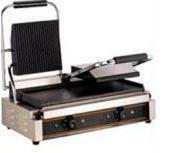 Looking for Commercial Fryer Griller ?